In MEMORY & COMPLICITY, we feel Georgia red clay under Eve Hoffman's bare feet on the dairy farm where she grew up; walk with her though an exhibit of one hundred and fifty postcards of lynchings. We see a girl in a yellow dress at the synagogue her great-grandparents founded--the synagogue bombed four hours later by white racists. We see black-faced jockeys in front yards. We listen to lullabies written in the Nazi concentration camps played on her mother’s piano--and the realization her mother, a fifth-generation Southern Jew, was pregnant with her as they were being written. We taste sweet-potato pies and feel the wooden pews of churches turning their backs as gay men die. We watch giggling children dive from the top of the refrigerator into their father's arms and as young adults shovel dirt onto his wooden coffin. We accompany a widow rebuilding her life, finding a Mason jar for fireflies for her grandchildren. The poems in Eve Hoffman’s MEMORY & COMPLICITY are rich with the details that comprise one woman’s extraordinary life. Starting with her childhood in rural Georgia, Hoffman describes “a girl of eight or ten on a dairy farm bordered/by a winding river with an Indian name I couldn’t spell.” This awareness of her surroundings expands to include the realities of racism (this is the South in the 1950’s and 1960’s) and anti-Semitism (Hoffman is Jewish), while lovingly describing a “barefoot child on summer days/picking blue cornflowers beside the ditch.” The balance between personal anecdotes and the social and political realities impacting the sweep of her life is maintained throughout with emotional honesty that is sometimes painful, but always beautiful. Eve Hoffman is a born storyteller and sixth-generation Southerner with deep roots in North Georgia’s red clay. Her poetry is a story of time, of family that called her home after sojourns (educational and otherwise) in New England, Africa, and then California. It was the same red clay that welcomed her home, but she, and it, had also changed. Here are stories of becoming, inseparable from those rays of self-awareness that mark the stages of personal life interwoven with historical currents. And here is a vision of a South still aborning, like herself. Hoffman’s poetry brings us home to where the heart lives. In the end, her work stands as a testimonial to a love that lives both in the ordinariness and in the trials, losses, and struggles of our lives--if we but look. Poetry is like memory. It stays with us, reappearing at moments of quiet, populating our imaginations, dotting our lives with color. We find our own stories in Eve Hoffman’s poetry--affirming, bearing witness both intimate and epic in the time flow of the second half of the twentieth century. 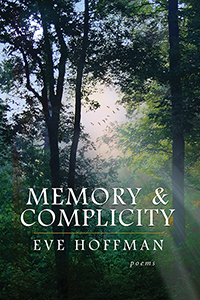 Eve Hoffman's book of memories arrives at a conflicted time in American life and culture, and provides much needed insight into the paths that led us here and possibilities for going forward. Her voice provides a rare window into complicated issues of identity, community, social evil, and moral possibilities. I hope that you will peer into this unsettling mirror, invited by her lyrical gifts, and begin the process of reflection, dialogue and action to repair a broken world.